Chili and cornbread go together like peanut butter and jelly. My notion for this can be traced back to my childhood when my mom made chili, it was always accompanied by cornbread. I hope you got a waffle iron after my sprinkles waffle post because having cornbread in the waffle form is amazing. 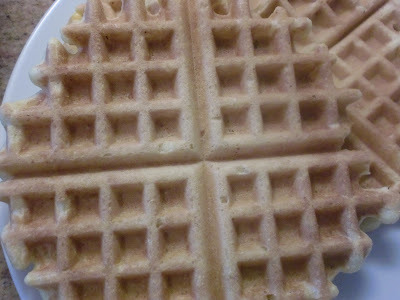 I put fresh corn cut off the cob in the batter, which added a little bit of crunch to the waffles, yum! 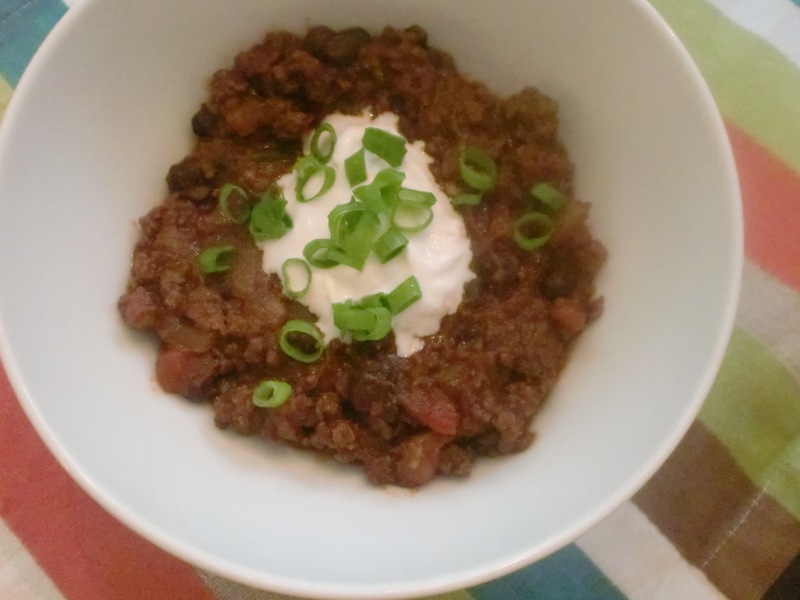 Everytime I cook chili, I make a new recipe. I am on an eternal search for the perfect recipe. Tonight's chili was great and unlike any chili I have ever had. This recipe has a few different ingredients not normally found in chili: beer, cocoa powder, coffee, and brown sugar. I know it sounds weird, but you just have to trust me on this one. We tried a new vegetable tonight (yay for us! 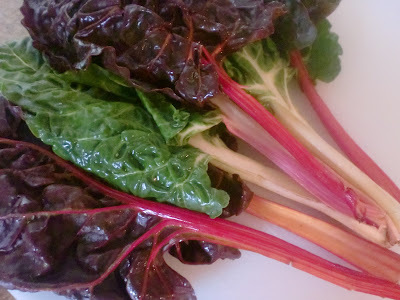 ), rainbow chard. The past few times I have been grocery shopping, the rainbow chard has caught my eye. On my last grocery visit, I finally picked some up. I had never made any type of chard before, and so I had no idea what I was doing. I researched online and came up with an easy and delish recipe. The flavor is mild and very similar to spinach. This recipe was derived from food.com, I of course added my own personal touches. My kids both had 2 servings of this, they gave it their stamp of approval. In a large pot, heat the oil over medium high heat. Add the onions and cook until translucent. Add the ground beef and garlic. Cook stirring frequently until the ground beef is completely browned. Drain the beef in a colander to discard the fat. Place the meat and onion back into the pot over medium low heat. Add the tomato, beer, coffee, tomato paste, chicken broth, brown sugar, ketchup, the spices, salt, and pepper. Stir until combined. Bring to a boil, and then lower heat to slowly simmer. Add the bean, and stir. Cook over low heat simmering slowly for 1 hour. Taste, and adjust seasonings to your liking. Scoop portion into bowl. Add a dollop of soy sour cream, and sprinkle with green onions. If you don't have fresh corn on the cob, you can use frozen shoepeg, and if you don't have that, canned corn will do, but the result will not be as good. I found this recipe on myrecipes.com. Mix together the cornmeal, flour, baking powder, sugar, and salt. Add the egg, soy milk, margarine, and corn. Mix until just combined. Let batter stand 10 minutes, while you heat the waffle iron. Cook according to your own waffle iron instructions. After searching the web and finding many ways to cook this, this seemed the easiest, and very pure. Cut the leafy part away from the stems. Cut the stems into matchsticks. Chop the leafy part. Bring a pot of water to a boil. Add the stems, and boil for 3 minutes. Then add the leafy part. Cover the pot, and cook for another 8 minutes. Drain the chard in a colander. Press out the excess water. 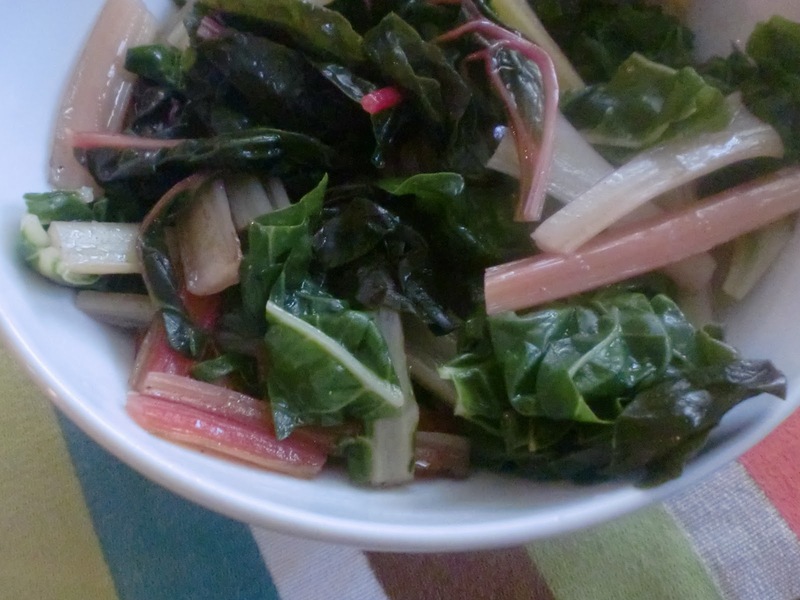 Place the chard into serving bowl. Squeeze the juice from the lemon half over the chard. Drizzle with a bit of olive oil (no more than 1 T.) Sprinkle with seasoned salt (I used Nature's Seasoning). Serve. I freeze the broth in batches and defrost it whenever I need it, very convenient. I'll post the broth recipe in the future.